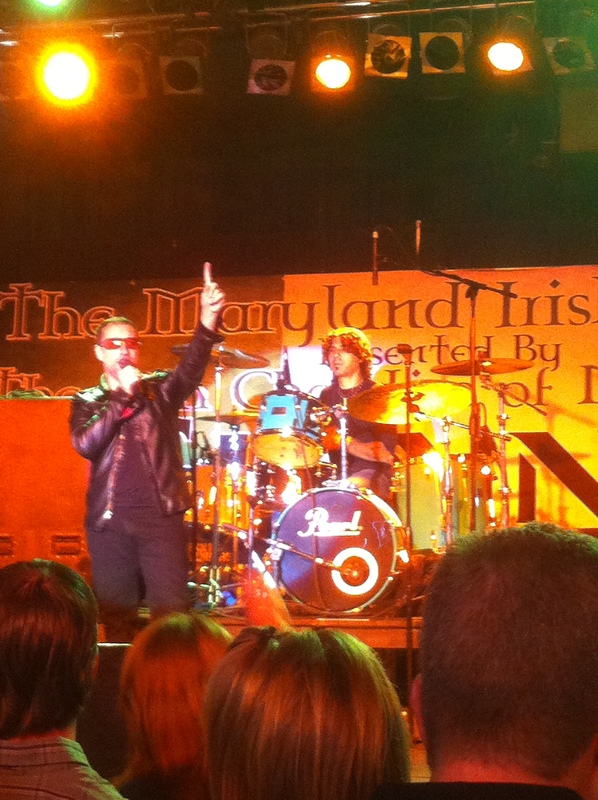 2U, U2 tribute band from Long Island, NY, played a 15-song 90-minute set at the Maryland Irish Festival Saturday night. It was a fun show. It was better than I expected, especially after seeing the band members set up. Fake Larry was no Larry at all. He had long black curly 80s rock band hair. Fake Bono sort of resembled Bono, as long as he wore his Bono shades. Fake Adam was very Adam. 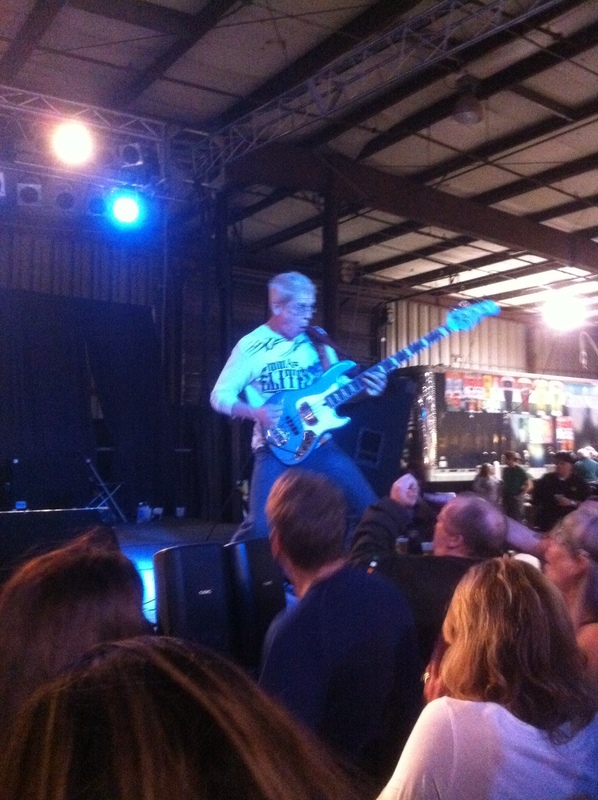 He had bleached blond hair and interacted with the crowd like Adam. Fake Edge from a distance looked like Edge with his knit hat and fu manchu. But at closer look, he was no Edge at all. When I moved back to Maryland over a month ago, I was excited because I would be closer to my U2 friends and hopefully some U2 tribute bands. 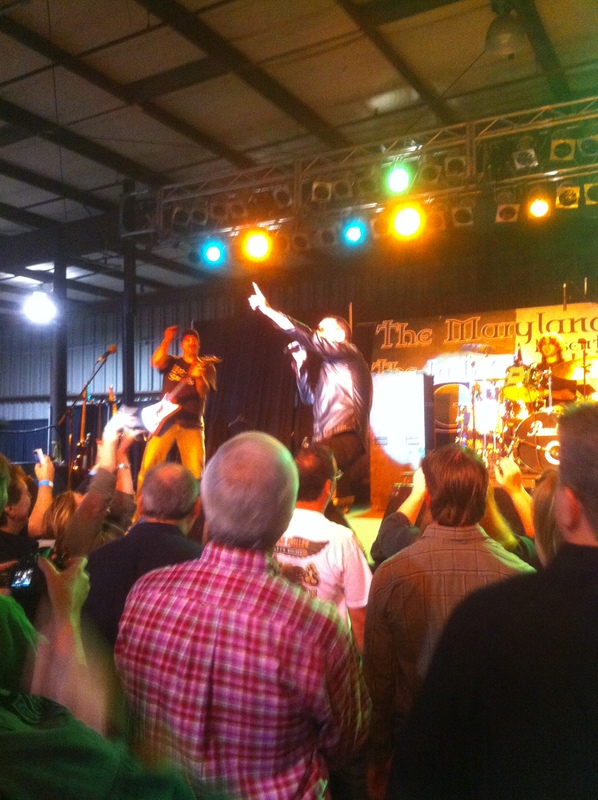 I did a search and couldn’t find any U2 tribute bands in Maryland, but saw that 2U from New York was playing the Maryland Irish Festival on November 12th. This happened to be my friend Abbey’s birthday. Our new friend Anisha, whom we met this summer on the 360 tour, wanted to go as well, so the three of us made a plan to see 2U at the Maryland Irish Festival. 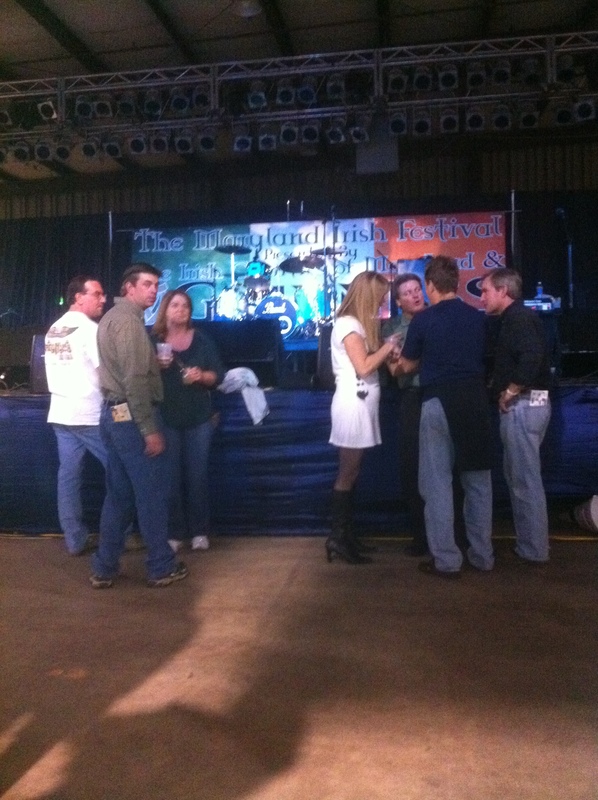 To make things even better, Mary Yeaple with the Maryland Irish Festival gave us free tickets on Twitter. 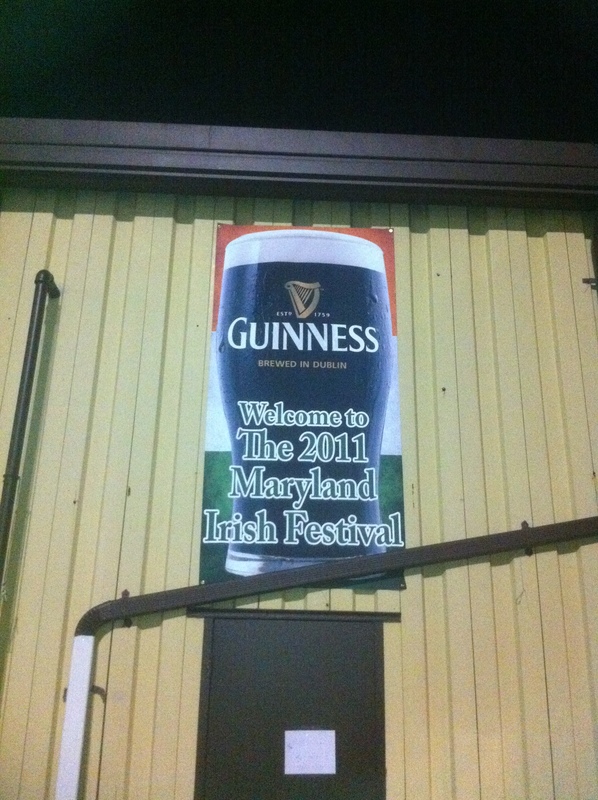 Abbey, Anisha and I met at the Maryland Irish Festival in Timonium at the Fairgrounds at 6pm Saturday. 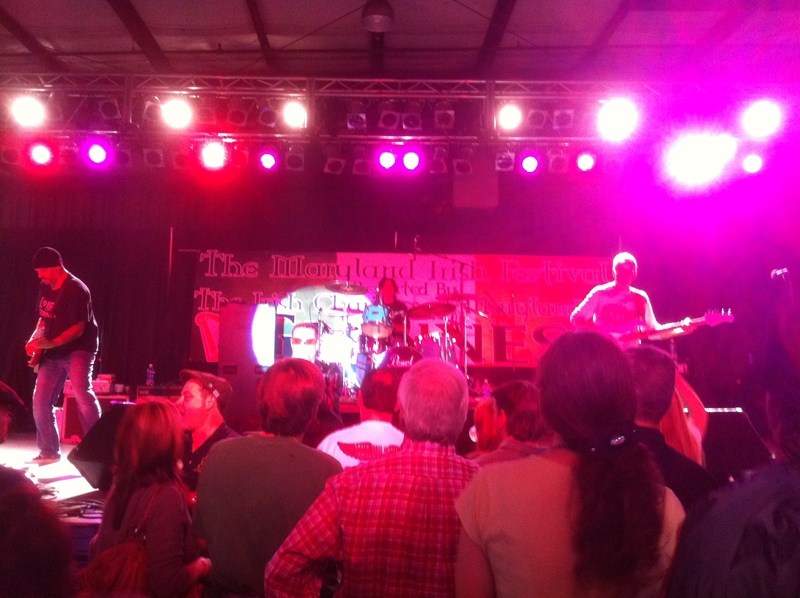 The festival was indoors at the Cow Palace, which was three big halls. There was music on 3 stages, crafts, historical recreations and even dog adoptions. But first we were hungry and wanted to eat. Unfortunately, the line was too long for what I really wanted, so I settled for a $7 sandwich, but the $2 iced tea was really good. We got our food and sat down. We ended up sitting across from two photographers, Phillip and Allison of The Susquehanna Photographic, who also knew Mary Yeaple. They were there to photograph 2U. They saw our U2 shirts and asked me how many times I had seen U2. When I answered 75, they thought I was joking. After we ate, we walked around to look at all the vendors. There was a lot of reasonably priced Irish goods, including silver jewelry, crafts and clothes. Luckily I did not buy anything, although I was very tempted. 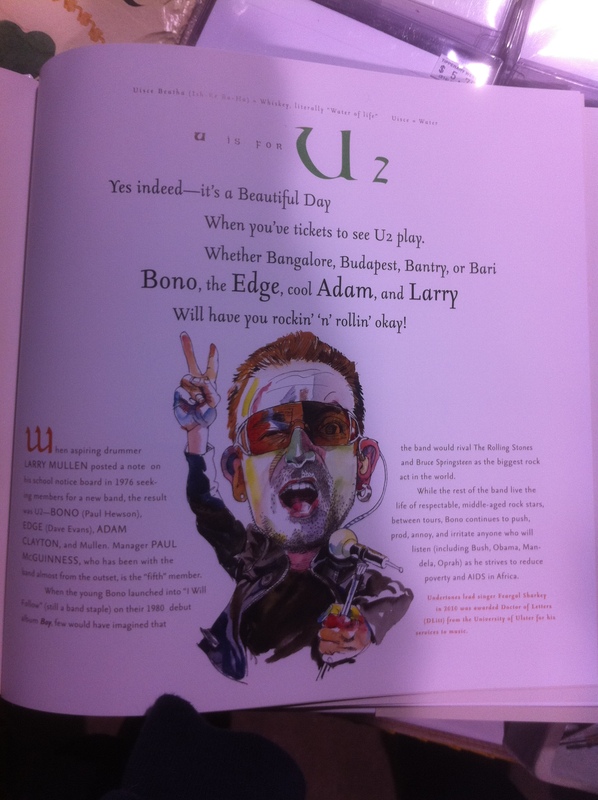 Anisha came across this A-Z book about Ireland and of course U was for U2. The members of the band were listed as Bono, The Edge, cool Adam, and Larry. Cool Adam?! Yes, he is cool, but why is he the only one who gets an adjective. Why not hot Larry?! why is Adam the only one who gets an adjective? We took our seats in the front row around 8:15. 2U was supposed to come on at 9. There was a woman standing right at the stage in her Walmart War night shirt. She was wearing a white U2 War night shirt with black hose and black high heel boots – really? While we were waiting, Mary Yeaple came over to introduce herself. She is such a nice lady and so generous. She told us about the Penn-Mar Irish Festival in June, which Abbey, Anisha and I now plan on attending. Just after 9:30, 2U finally took the stage. I wasn’t expecting to get too excited, but when I heard the chords of Beautiful Day, I could barely contain myself. And by the second song Until the End of the World, I was on my feet dancing in the crowd. I just can’t stay seated listening to U2 music, even if it’s not really U2. The audience seemed much older than a real U2 crowd, or at least the crowd I’m used to in GA on the floor. They were very into the old songs, but didn’t really know Magnificent. It was a good show, but I would have preferred newer songs – like those played on the 360 tour. I feel like U2 tribute bands should play shows that resemble the most recent U2 tour. But 2U did play most songs like U2, with a few exceptions. There was a Led Zeppelin jam in the middle of Bullet the Blue Sky and a snippet of a Journey song at the end of With or Without You. But like the good old days of U2, I really enjoyed the Ruby Tuesday/Sympathy for the Devil/40 mix at the end of Bad as well as the addition of Dirty Old Town, even if it was sung by the fake Edge instead of the real Larry. The set list was as follows: Beautiful Day, Until the End of the World, New Year’s Day, Desire, Magnificent, One, Bad / Ruby Tuesday / Sympathy for the Devil / 40, Where the Streets Have No Name, Dirty Old Town, Bullet the Blue Sky / Led Zeppelin snippet, Mysterious Ways, Sunday Bloody Sunday, Out of Control, Gloria, With or Without You / Journey snippet. Please watch my video of the 2U show at the Maryland Irish Festival.